Bison is testing out the new Freightliner Cascade pre-series, which will likely be released as a 2018 model. At Bison Transport, we’re always keeping up with the latest advancements in trucking equipment and technology. We pride ourselves in keeping one of the most modern fleets on the road. Sometimes, our dedication to keeping up with the times is recognized in special ways and we get the privilege of testing new equipment. In September, Daimler Trucks unveiled the latest model of its Freightliner Cascadia, which will be released to the public as 2018 models. Freightliner has entrusted Bison with one of 12 pre-series units in North America so we can provide feedback on the truck’s performance. This is the first full re-design since Freightliner introduced the Cascadia in 2007. 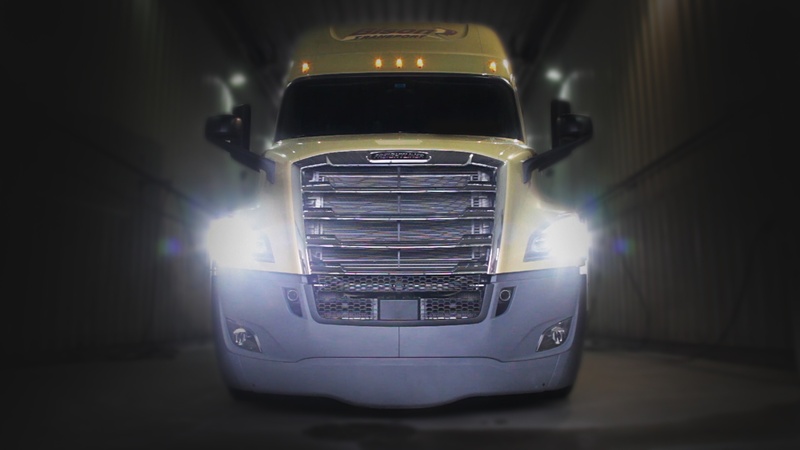 According to Daimler (Freightliner and Detroit Diesel’s parent company), it will achieve as much as 8 percent in fuel savings over the current Cascadia Evolution model. A new safety package, called Detroit Assurance 4.0, features Active Brake Assist with three stages of collision mitigation, and Adaptive Cruise Control that automatically adjusts the truck’s cruising speed to maintain a safe following distance. This system uses radar that tracks up to 40 objects simultaneously, up to 825 feet in front of the truck, and will identify the top 6 vehicles by level of threat, with a speed, distance and time refresh rate of 200 times per second. There is also an optional camera system available that tracks the truck’s position within the lane and features audible lane departure warnings. Judging by the improved safety statistics Bison has experienced with older but similar systems installed in both our Freightliners and Volvos in the past, we should see even greater safety improvements with this high-tech system. The new vehicle will also offer advanced connectivity that will allow Bison’s Maintenance department to monitor the vehicle’s performance remotely, providing us with more information that will help our Drivers to keep moving. The technology will even allow over-the-air software updates to be sent to the truck when needed. Jack Fielding receives his Two Million Miles Safe Driver award. Bison Transport is very pleased to test this new high-tech tractor with one of our well-known award-winning Drivers, Jack Fielding. 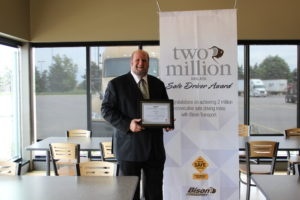 He has accumulated over 1.6 million consecutive accident free miles with Bison as a long haul and turnpike (LCV) Driver, with well over 3 million accident free miles driven in his 40 year professional driving career. Jack has also been an In-cab Instructor, a member of Bison’s Driver Advisory Board, and a member of the 2011-12 Ontario Road Knights team. He was named as the 2013 Company Driver of the Year by the U.S.-based Truckload Carriers Association (TCA), and the 2015 Driver of the Year by Volvo Trucks Canada and the Ontario Trucking Association (OTA). He is an overwhelming supporter of the industry and we are very proud to have Jack on our team and to have him testing this new truck! Watch for Jack on the road and give him a wave!